12 years old, my mom always instilled in me the importance of taking care of my skin. The benefits of a good skincare routine are truly rewarding for years to come. As I grew older and started wearing makeup, my mom reminded me to take my makeup off before bed. I remember her words so clearly, "Take your makeup off or you're going to get pimples!" in Spanish of course. Fast forward about 20 years later (geez I sound old! ), there isn't a day that goes by that I don't take care of my face in one way or another. It's true what they say, it is all a matter of routine pretty much with anything that you want to achieve. Want better skin? Prioritize and give yourself those extra 10 minutes in the morning and at night, daily. For me that means using my latest favorite day cream, moisturizer or night cream to my weekly masks. Masks are also such an important part of my skincare. 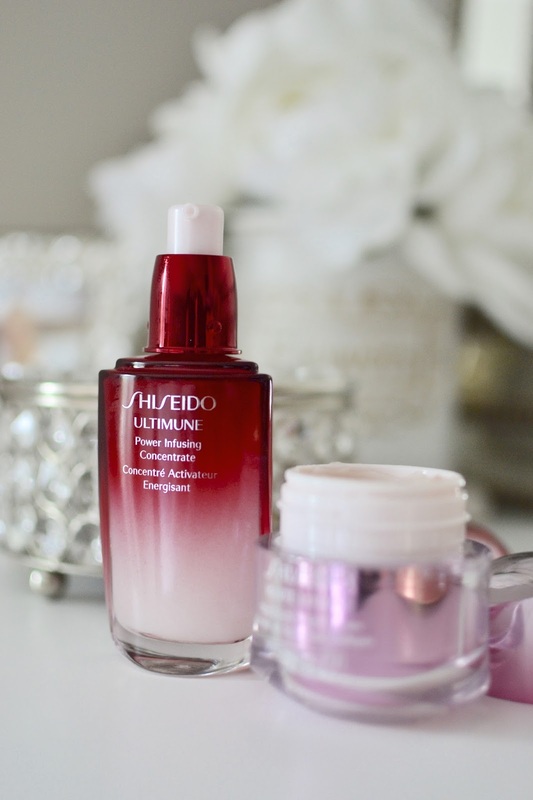 For the past few weeks I've been using Shiseido's Ultimune Infusing Concentrate before my moisturizers during the day and White Lucent MultiBright Night Cream before bed and today I wanted to share the benefits and results I've seen. It's always been important to me to prevent signs of aging and wrinkles, especially the damage that it can cause your skin if you are not following a great skincare routine. 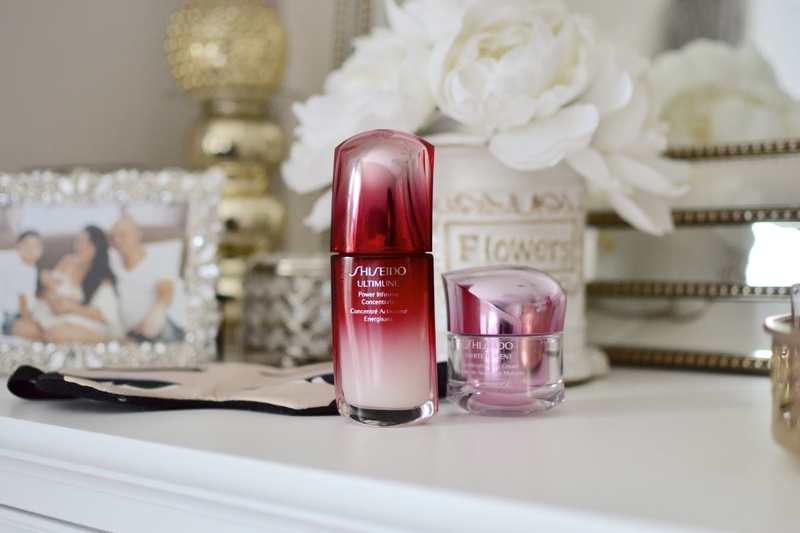 With Ultimune, not only do I feel like my skin looks better and more radiant, but also feels smoother. Ultimune is a pre-treatment for all skin types which helps prevent signs of aging and can be used under daily moisturizers or serums. The results are 90% visible just after a month's use. What I like most about this product is that it protects your skin from environmental damage while boosting your daily moisturizer to help your skin become healthier and brighter. I love when my skin looks and feels hydrated, not just because I love going without makeup but also because it makes my makeup application better. Having great skin doesn't just feel great, it makes life easier. I can run out on my weekday errands bare-faced and feel confident in my skin, but I can also count on great skin for the days I do apply makeup. We all know that any great makeup look starts from under and that's your skin! Great skin is equivalent to an amazing makeup look. Night creams are probably the most important part of my skincare routine. Why? Well it is at night when we clean off all our impurities and hidden dirt, as well as any traces of makeup. So after I've cleansed my skin, I apply Ultimune and Shiseido's White Lucent MultiBright Night Cream. This night brightening cream targets spots and reduces the appearance of acne scars. 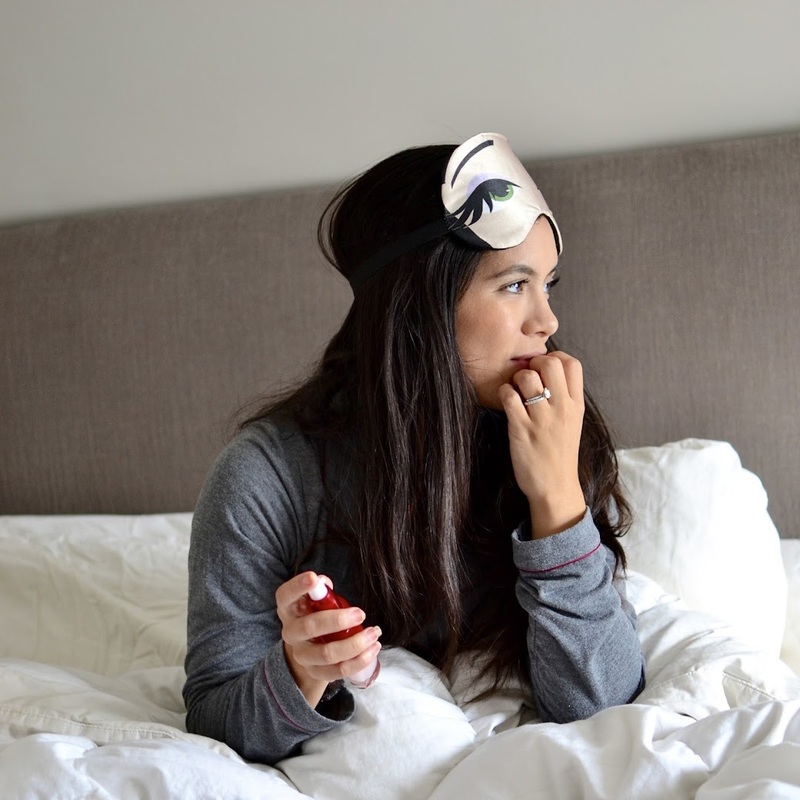 It is so important to remove your makeup at night before bed but it's also important to apply a great night cream and let your cream do all the work while you sleep. I have to be honest, there have been times when I am so tired I forget to remove my makeup and use my night cream and the difference from the nights that I do follow my skincare regimen to the nights when I don't are truly visible. My skin looks so hydrated and healthy the next morning when I follow my nighttime routine and, in turn, I wake up feeling and looking great. This White Lucent MultiBright Night Cream comes directly from Asia and has traces of Japanese cherry blossoms to help skin become resistant to dark spots. When you apply the cream, your skin instantly feels hydrated and healthier. So if you're looking for a new skincare line to prevent wrinkles and fine lines as well as reduce the appearance of spots and acne scars, you should check out Shiseido's Ultimune Power Infusing Concentrate and White Lucent MultiBright Night Cream. Don't forget to follow a regimen and always remove your makeup. Great skin is my best friend and makes my life easier. Who doesn't want better skin? This post is sponsored by Shiseido, as always all opinions are my own. Thank you for supporting my blog and trusting the brands I use and love.